The construction industry is one of the most heavily regulated in the United States. LicenseLogix can help with all your business licensing needs! (800) 292-090 and this is no less the case for contractors working in specialized fields. Each state has unique contractor licensing laws, specialty classifications, and specialty contractor application requirements. The threshold question that must be addressed is whether the roofing contractor intends to do residential and commercial work. For example, the Minnesota Department of Labor and Industry requires that residential roofers be licensed with the state by filing a Residential Roofer New License Application. On the other hand, Minnesota does not license commercial roofing contractors at the state level; they must be licensed at local level. Currently, 32 states require licensure for residential and/or commercial roofing contractors at the state level. The remaining 18 require licensure at either the state, county and/or municipal level. A state could hypothetically require licensure at two levels, or all three. 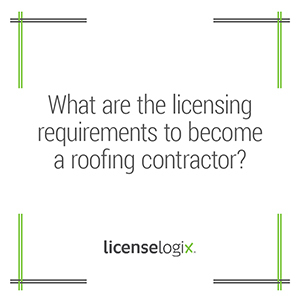 For example, the Idaho Bureau of Professional Licensing requires roofing contractors to file an Application for a Business Entity Contractor Registration. Additionally, the city of Idaho Falls requires roofing contractors to file an Application for Building Contractor License. Similarly, roofing contractors must file a Building Department License Application with the city of Pocatello. Other requirements to become a roofing contractor may include, but are not limited to: (1) proof of worker’s compensation insurance, (2) proof of unemployment insurance, (3) proof of liability and property damage insurance, (4) proof of passage of residential, commercial and/or industrial examinations, (5) submission of a surety bond, (6) the designation of a qualifying party and/or construction supervisor license and (7) copy of Articles of Incorporation or Partnership Agreement. LicenseLogix will navigate the maze of state, county and municipal licensure requirements for roofing contractors, as well as manage all ongoing license renewals to ensure continuity in compliance. For additional help you can click contact us, or give us a call at (800) 292-0909.